Recently, there have been a lot of pet treat warnings in the news. Part of our job as an emergency veterinary hospital in Southeastern Massachusetts is to provide services related to incidents that occur when pets consume treats that cause illness or pain. Anchor Animal Hospital in Dartmouth also provides routine veterinary services, preventive treatments, vaccinations, and counseling to pet parents. Our pets love treats and toys, but not every treat and toy on the market is a good choice for your pet. Rawhide treats and bone treats products have come under fire from the veterinary industry, as well as the United States Food & Drug Administration (FDA) due to illnesses reported nationwide. The FDA has recently warned consumers about health issues that have been reported due to “bone treats,” which are available at pet stores. Also known as “rib bones,” “ham bones,” “femur bones,” and “smokey knuckle bones,” these treats are a favorite treat for owners of big dogs who enjoy chewing and gnawing on these products. Since 2010, the FDA has received 68 reports of pet illnesses related to these treats specifically. Pet owners and veterinarians have reported issues with these treats for over 90 dogs during the same period. Illnesses and injuries include blockages in the digestive tract, diarrhea, choking, vomiting and 15 cases of death. Rawhide chews are a very popular dog treat. They have a reputation for being good for a dog’s teeth and a great option for dogs that like to chew. Rawhide treats are made from the inner layer of cow or horse hide. The hides are cleaned and cut or ground, then pressed into chewable dog treats. Some manufacturers add beef, chicken, or liver flavorings to make them even more appealing. Unfortunately, contamination with E.coli or Salmonella, digestive irritation, chocking and blockage risks, and other related problems can lead to illness or even death. In particular, rawhide treats from China and other countries that do not have stringent requirements in manufacturing, have been deemed dangerous by the FDA and other government regulatory entities. Pet owners need to be aware of the risks. Your best bet is to seek veterinary care in Massachusetts and work with your local animal hospital in Dartmouth to determine which treats are safest for your pet. Veterinary ultrasound in Dartmouth is available for dogs who have swallowed treats or have obstructions due to other objects. It is important to bring your pet to an emergency veterinary hospital the moment that you suspect something is wrong. Discuss treats with your vet and get alternative options for bone treats and rawhide chews that are safer and less likely to cause issues. 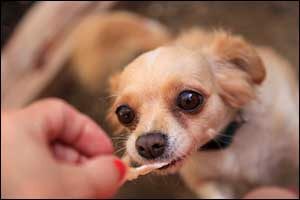 For any treat, even if it is not a bone or a rawhide chew, pet owners are urged to research the brands before buying. The same holds true for dog food brands. Don’t just assume that because it is a well-known brand or if they advertise on television that it is safe for your pet. Regularly check the “recall” lists and “warning” lists for pet foods, treats, and even toys to know which products are best for your pet. Supervise your pet carefully with any type of new treat and know the warning signs of choking and intestinal issues. If you notice anything going on, bring your pet into the local emergency veterinary hospital or contact Anchor Animal Hospital in Dartmouth directly. Your best bet as a pet owner in Southeastern Massachusetts is to build a rapport with a local veterinarian. Preventive and routine veterinary care in Massachusetts is important to the health and well-being of your pet. At regular check-ups, you can ask questions about treats, toys, chews, and diet, but you can also contact your local animal hospital in Dartmouth at any time if you have concerns. Anchor Animal Hospital provides a broad range of services for pet owners, including routine care, vaccinations, preventive treatments, surgery and pain management, and veterinary ultrasound in Dartmouth. We are also an emergency veterinary hospital and are AAHA Accredited. Give us a call at 508-996-3731 to schedule an appointment for your pet or to speak with one of our friendly and knowledgeable veterinary team members.